With a little more than a week to go until CES 2009 and arguably the most critical release in the company's history, we cannot overlook Palm's small but still news-worthy contributions to legacy Palm OS Garnet users during 2008. Regardless of what happens in 2009, for all its shortcomings OS 5.x Garnet remains a tried and true mobile OS that still enjoys a fair amount of developer, carrier, and user support. Let's take a few moments to review the most important events from Palm in what was unquestionably a transition year of carryover products and mild tweaks to existing devices. The year kicked off with the arrival of the much-delayed Verizon Treo 755p in Verizon corporate retail stores on January 7th. The device had technically been available online and via the company's B2B network in December in an exclusive teal color scheme. While on the subject of all things anticipated and delayed, Palm and Access' long-awaited release of the final release version of the Palm Desktop for Windows Vista also occurred in January. Unfortunately, official Palm Desktop support for 64-bit versions of Windows still does not exist, despite the industry rapidly shifting to embrace 64-bit computing. February saw the widely expected launch of the GSM version of the Palm Centro in both unlocked GSM and versions for AT&T and numerous other global carriers. Also in February we began seeing the first of many aggressively-priced Centro promotions. The device's razor-thin margins were no doubt a huge reason for Palm's battered earnings reports from recent quarters. One silver lining amidst this gloom was word that the little Centro had reached 1 million units sold in March. The arrival of summer brought a flurry of Palm OS and Centro news. AT&T kicked off the summer heat with the release of their exclusive icy "electric blue" version of the Centro alongside a price drop of the handset to $69 with 2 yr contract. Verizon then finally jumped on board the Centro bandwagon with their ironically titled "cobalt blue" Centro in June, leaving only Alltel and T-Mobile as the main domestic wireless carriers not offering some form of the Centro. June also saw the release of a substantial firmware update for Sprint Centros, bringing them up to date with the Google Maps location functionality already embedded within the Verizon and GSM versions. Even though the new 2.0.2.0 version of Google Maps was compatible with all Palm OS devices, to the chagrin of Garnet Treo users everywhere, Palm only saw fit to update the Centro for Google Maps location functionality. July was the month of firmware updates. Sprint finally brought their version of the Centro up to par with a substantial 1.07 ROM update in July, adding Google Maps location support and a number of smaller performance and stability tweaks. July brought about the Verizon 755p 1.08 ROM update, which I covered at length. Of course, what Verizon giveth they also taketh away, and their relatively young 755p reached EOL status in July, though Sprint and Alltel versions remains available as of this writing. Around this time, the competition in the entry-level smartphone sector began to intensify tremendously and Palm announced a fourth consecutive quarterly loss. As a result, we began seeing "free" and heavily discounted Centros on all carriers from a variety of retailers such as Best Buy. 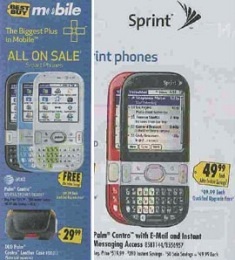 Even Palm's remaining PDAs enjoyed a last turn in the spotlight of a nationally-advertised weekly sales flyer. Of course, hot on the heels of negative news was July's encouraging announcement of 2 million Centros sold in less than a year's time. After a pretty active summer, things were fairly quiet on the Palm OS front at Palm until October's surprising announcement of a refresh of the Sprint version of the Centro. This surprise announcement brought two new colors, rose and green, for the holidays while retaining the traditional black. We profiled the Olive Green version here. Palm saw fit to improve the devices with their soft-touch rubberized exterior coating, a new 1.08 ROM version, the latest versions of Facebook and Google Maps preinstalled in ROM. Most importantly, however, Palm doubled the device's storage space to 128MB, the largest ever for a Palm OS smartphone. It's still unknown if these refreshes are a Sprint exclusive or will eventually be rolled out to other CDMA carriers and to the GSM Centro once existing stocks of the older 64MB version are depleted. The Centro cost-cutting mania reached its zenith in October with Verizon "paying" customers $25 to take their Centro on a 2yr contract. Meanwhile, Palm's stock price continued to plummet amidst continued financial woes and gloomy analyst predictions. With the Treo 755p already reaching End-of-life status on Verizon, the Treo 680 and 750 quietly dropped from Palm's active lineup, and the Treo 700wx and 800w rumored to be headed for extinction soon, Palm looks to be heading into 2009 in serious lean and mean fashion. 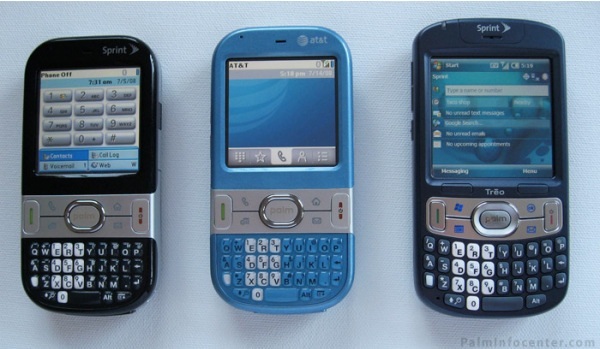 The Centro and the Treo Pro, both in GSM and CDMA flavors, look to be Palm's mainstays heading into 2009. Alongside, of course, whatever is unveiled in Las Vegas at CES. 2007, 2006, 2005, 2002, 2001. Don't forget one of the most significant landmarks of 2008. Colligan's recent announcement that Palm would not manufacture any more PDA's -- only smartphones. That marks the end of the pure 'Palm Pilot' line. To take that a little further, Colligan suggested (vaguely) that the next =consumer= devices would be Nova-based as well. The article was actually written a few days prior to the most recent Q2 report + comments from Ed C. and co. Ryan just put it on the backburner over the holidays due to everyone having family obligations etc. We can stick in another line or two summarizing the events from the 2nd half of December to the article, no problem. It's been a long year, that's for sure. 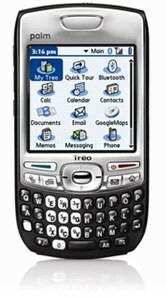 The most exciting device Palm put out wasn't even "Palm-powered" - although at least the Treo Pro finally saw them getting their hardware act together. A Nova-powered version is something I'm very much looking forward to in '09, along with a nice variety of hardware designs. At the very least, we should see Palm put out their first large-screened phone. >>>OS 5.x Garnet remains a tried and true mobile OS that still enjoys a fair amount of developer, carrier, and user support. Or should "fair" be read as "It's not dead yet." Neither are zombies, but they still STINK. I can't agree that Garnet stinks. It gets the job done, which is more than I can say for loads of operating systems. Obviously, I don't care what you think. And if there is such a big developer base still around, why isn't there a *single* eBook reading program that can do *ePub* files on it? Meanwhile, Stanza has over 600,000 downloads for the iPod Touch/iPod, can do *ePub*, *and* just added Fictionwise eReader compatibility. Until Garnet has ePub, it remains a 3rd-rate POS. And I don't mean PalmOS. Me? Fanboyism? Please. Just because I still maintain that Garnet is the tried & test comfortable old shoe of mobile OSes does NOT mean that Centro Claus came to visit me for Christmas and turned me into a Palm Apologist with some magical fairy dust. As long as you don't want to do multimedia whiz-bang, fancy GPS navigating, wi-fi etc., Garnet still DOES the PIM essentials faster & better than anything else. Yes, "fair" is a polite way of saying "it's dying but it ain't quite dead yet". Regardless, the zombiefied Garnet DOES still enjoy SOME developer support which is more than the Treo Pro can tout. Palm's sole Palm OS device, the Centro, still has the widest availability of any current Palm smartphone (regardless of OS). >>>Centro Claus came to visit me for Christmas and turned me into a Palm Apologist with some magical fairy dust. Is that some sort of slap at gays? Well see, if you'd mentioned the PIM part, you'd have had no argument from me. PIMs are still world-class and why I stick with the accursed LifeDrive. Garnet does not stink; it's just ancient in terms of technology years. I mostly use and develop for my iPhone now, but I still prefer using a few PalmOS PIM apps over anything I've yet found in the iPhone App Store. No jabs at anyone from any walk of life other than whomever gave that silly Palm ad campaign the green light. Every $ available at Palm should be thrown at finishing/perfecting/starting work on Nova. Smoke & mirrors marketing and producing expensive primetime TV spots for a fast-fading, bottom-feeder product (Centro) is not the way to blaze a succcesful trail into '09. You know, come to think of it...wouldn't it be better to jump dump the tragic LifeDrive (had you listened to my warnings in '05 you'd have realized that is a CURSED product!) and replace it with a much slimmer, swifter, reliable and utterly more useful TX instead? And, had you paid attention to some my past ramblings, you'd know that I CONTINUE to espouse the continued robustness-nay, the continued EXCELLENCE-of Palm's PIM apps. It's sad (but also quite telling) when a Pilot 1000 from 1996 still crushes an iPhone or BB Bold/Storm etc for day to day PIM functionality and usability. Someone somewhere should award some kind of lifetime achievement award to Rob Haitani and the rest of the gang that came up with the initial Palm OS core PIM apps. Speaking of Mr. Haitani, what ever happened to him? What's he been up to? Haven't heard a mention of him since the good old days. Just out of curiousity, what other mobile OS has support for ePub? Making support of ePub your bellwether for 3rd rate POSness, sounds like rabid iPhone fanboyism to me. Haitani has moved on to vitamin D where he's waiting for another dot com bubble which doesn't look like it's going to happen any time soon. he was great for the simple GUI for Palm OS, his "keep it simple - watch out for feature creep - don't try to do too much with a small device" mantra might have helped keep PalmOS in the dark ages. >>>Just out of curiousity, what other mobile OS has support for ePub? Making support of ePub your bellwether for 3rd rate POSness, sounds like rabid iPhone fanboyism to me. ePub is what the major publishers have settled on. eReader and MobiPocket are now doomed legacy formats that will eventually go to Electron Hell. Just not as fast as I'd like. Yeah, Haitani really needs some damned Lifetime Achievement award for the PIMs. Or maybe he'll come up with something even more remarkable for Nova at his startup. I'll get a TX when Palm drops the price to $99 - or less. It has no higher value to me than what I've sunk into the LifeDrive. With all due respect, mikecane, if your assessment of Garnet is based solely upon the ability (or your claimed lack thereof) to handle a certain format of epubs, that's just, well, ridiculous. It's like evaluating an automobile based solely upon what kind of stereo system it has. Garnet does loads more than a Kindle -- there's a great epub handler, or an iphone, there's another one does. You can't seriously expect us to believe that this is all you want to do with these devices, can you? Dude, you need to open a book. Good point. And if we CONTINUE to use ePub as the benchmark by which all mobile devices are measured....well, I imagine it'd be easier to shoehorn ePub support into Garnet than it would be to get a couple thousand apps + media players + games etc. onto the Kindle or the Sony Reader. I think the Sony in particular is a fine e-book reader (the Kindle...not so much so) but they are dedicated devices and shouldn't be part of an apples to oranges comparison like that with PDAs/smartphones. NO, Garnet doesn't get the job done fanboy. It's well known how Garnet was incapable of handling simultaneous wi-fi and phone connections or multi-tasking or umts 3G. Palm wasn't able to produce a Palm OS smartphone with wifi or umts 3G due to Garnet's limitations. It was this inability that pushed me from Palm OS to a WinMob phone that offered the "yes we can" approach. I was initially skeptical about a smartphone's ability to multitask; I've since found that being able to discuss something on the phone whilst simultaneously referring to a website and/or email on the smartphone to be practical and useful. I wasn't keen on Windows Mobile but it does what I ask of it and all of what I used to do on Garnet, I find I don't even need Styletap. So please don't tell me how Garnet gets the job done. Garnet is way behind other current mobile operating systems in ability. To be totally fair....the CDMA Centro, since it DOES support EVDO Rev. 0, is still quite capable, though it would have only another 6-9 months TOPS to be viable on the market (and that's being generous) as a low-end smartphone based on the criteria of the "average" consumer targeted by the carriers. The GSM Centro, EDGE and all, is indeed fading fast and only really suited as a cheap freebie offering or as an ultra-cheap unlocked device for those needing to support legacy Palm OS apps. More so than anything else, we are hearing continued rumblings that carriers don't want to have to support so many different OSes and dumping Palm OS (definitely Garnet and possibly just passing on Nova) is looking like a more and more realistic scenario with each passing day. What I think should be a justifiable concern for Palm is an utter lack of carrier interest--what if Nova DOES get completed on time and is totally gee-whiz great, stable, and all that we hope for it to be....but no carriers bite? That'll be the kiss of death for Palm. P.S. IMO, this (not coverage or pricing) hodgepodge of carrier exclusives & CDMA vs. GSM foolishness remains the biggest problem with the fragmented domestic US wireless market: If I want handset X that is available only on carrier Y and I have carrier Z, I simply cannot have it unless I jump ship and/or sign another contract. I'd LIKE to have the coverage & flexibility of a GSM device but there is simply no getting around the fact of the superior CDMA coverage in most of the United States, especially in rural areas. or you could just move out of the sticks? You had to "be a fan" to enter their contest - no fan, no entry. I'd reply to Harold, but that Martian-to-English translation was too poor to parse into any sense. Oh, I'm not comparing dedicated readers to Palm OS. Don't make that mistake. I'm talking about things we do here in the 21st century - like *ePub*. And having a developer base that's interested in doing 21st century things. No ePub for PalmOS = 20th century = lack of developers. Today is the final day of my blog (thank the gods!). One post I hope to do is about Palm's upcoming OS. Update: That planned blog post is a casualty of flagging motivation and lack of time. Eh. No big loss. What about Mike Cane's predictions for the year? That used to be one of the best, insightful articles that came out each year. Any chances we'll see another? RE: What about Mike Cane's predictions for the year? i think he got tired of being consistently wrong year after year after year so he's now moved on to predicting doom ex post facto. He's been selling nails on eBay with free shipping. The ones that come out of Pam's coffin. Next month will be interesting. I still can't wrap my head around the idea of an "iPhone nano." Damn thing should be getting bigger for eBooks - iPod Air/iPod Touchbook - not smaller like the Playskool Centro. That is one reason for two devices, you don't want to hold up a brick to your ear. I'd rather have a PDA and a small phone with both talking to each other seamlessly than a converged device that is too big/small with too little battery life and pricey data plans. Two devices = two things to charge. This being said by someone who will soon be carrying three. LifeDrive, eBook reader, and the phone. As noted elsewhere, if ya want a couple examples of "seamless peering" (or rough equivalent), watch a Nintendo DS and (as many as 16?) other DSes peer up or even the NDS and a Wii. i hope that the quality and quantity of comments here and at the other POS sites gets better in 2009. you've all become lazy and indifferent to POS. you should be ashamed of yourselves. It's like being a fan of a losing football team like mine, the Cleveland Browns. You still go to the game but you boo them because they stink. In the end you are still a fan but not happy with the team. That's how I cheer for Palm. No indifference here lizard boy. When Nova comes a rockin', they'll be no more time for knockin'. Remember, just like in hi yield bonds, "Past performance is no indication of future expectations". It's a new day in Sunnyvale. Palmsource is a distant memory, Nagel has taken over as Senior manager of the WorldCom & Enron merger, Palm kept only the best code from Cobalt, BeOS engineering is in it's swan song behind the scenes doing miracles, the Foleo II team has worked out the final kinks, and breakthrough new designs are only 10 days out from your very eyes. Go ahead and get your iPhones, and BBs ready for eBay, because the Nova is about to explode in Vegas like Oprah's dress size. It's gonna be a wooooonderful year. That should get the quality back to even keel ya doubter! now all we need is for you to go over and lay hands on Nova and give it a final blessing before it goes out into the free world. == completed by the end of this year..."
it's due to come a rockin' by COB tomorrow. Christ, I started cheerleading Palm weeks ago, Gekko, you eejit (see above link!). You pooh-poohed it! Hypocrite. Go count the losses on your 401K, chump.